3r3128. Having understood, how to work with an electromechanical punch card sorter (from the point of view of the average user), and starting to get to know him more closely (from the engineer’s point of view), you expect to see in him several sensors for reading holes in punch cards and about ten manipulators, each of which takes a punch card into its pocket. However, the electrician of the sorter is much more elegant and simple: all its intelligence rests on one sensor and one electromagnet. How exactly, read below. 3r3145. 3r3122. Punch cards come into the sorter one by one (see the bold line on the diagram, marked with the letter "C"). Sideways, the lower edge is ahead (this edge is called the “edge of nines”, because there are nines along the bottom row). A small wire brush (marked with the letter “A”) slides along the surface of the punch card (one of its columns), trying to close the electrical circuit through contact with a metal shaft (marked with the letter “B”). Slides along the column specified by the operator. From the number 0 to the number 9. If there are no punched digits in the current column, then the punch card does not allow the circuit to close. But if there is a hole in the punch card, the wire brush is in contact with the metal shaft, and so on. closes the circuit. When the wire brush closes with a metal shaft, an electromagnet is activated (marked with the letter “D”), which pulls the metal reinforcement (marked with the letter “E”). 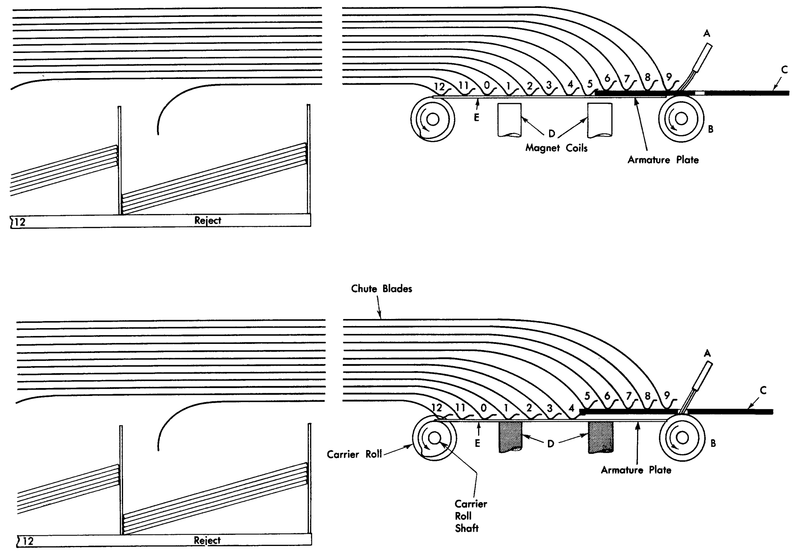 These fittings, in turn, carry along a stack of guide metal strips (these strips are marked on the diagram with the words “Chute Blades”), - those of them that the card has not yet passed. As a result, a “tunnel” is formed in front of the punch card to enter the correct pocket. The bottom line is that the edges of the guides of the metal strips are located at the same intervals as the lines on the punched card, so that the hole (if pierced) is detected just before the punch card reaches the corresponding strip. If there are no punched digits in the current column, the punch card falls into the pocket for discarded punched cards (for cards that are “out of the game”). 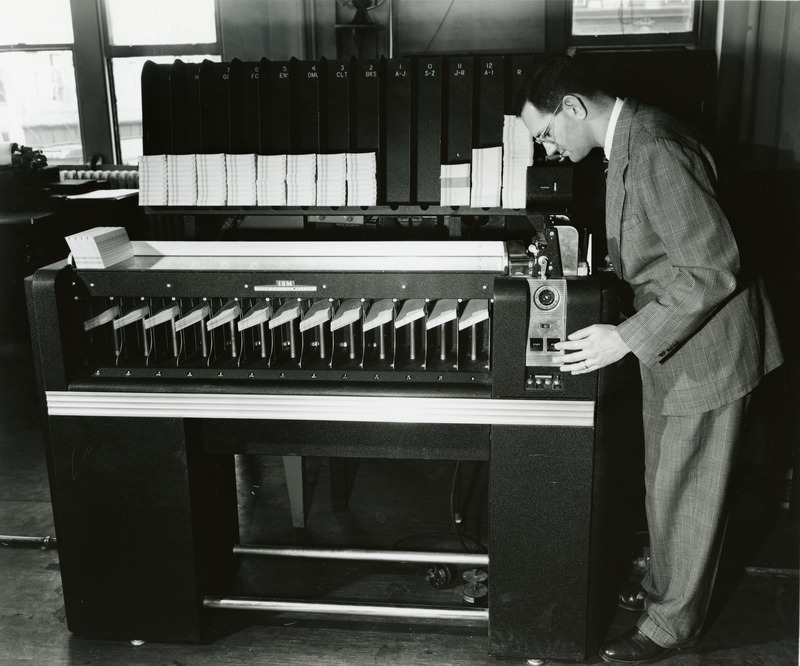 , the very first sorter, released by IBM in 192? drove 450 punched cards per minute. He performed data processing exclusively electromechanical way. Without transistors, and even without tube electronics. The whole "intelligence" was built on an electromechanical relay and electromagnets. Despite its technological primitiveness, the Type 80 was classified as a high-precision equipment. Why? Because the speed with which he worked meant that the edges of the guiding metal belts would fall and rise more than seven times a second. Any overlap in time could lead either to an incorrect sorting or to the fact that the edge of the metal guide tape would damage the punch card. 3r3122. , the next model of the sorter from IBM, drove already 650 punch cards per minute. For an electromechanical relay, this speed was too tough, and for the first time in its new model, IBM used tube electronics to control an electromagnet. 3r3122. , released in 195? sorted punch cards at an even more fantastic speed: 1000 pieces per minute! It was implemented a more advanced algorithm for processing of punched cards: this model read all the holes of the selected column from the punched card at once. Due to this, the Type 83 could perform new tasks, the solution of which on earlier models was fundamentally impossible. Among such tasks: rejection of erroneous punched cards, - in which several holes were punched in one column at once. 3r3122. 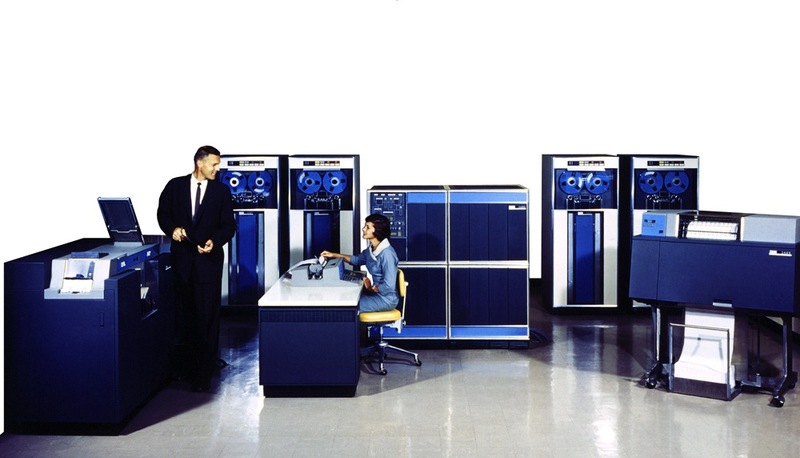 , the most productive of the models that IBM has ever released, was released in 1959. In the literal and figurative sense of the word In this sorter wire brush gave way to an optical (photoelectric) sensor. Plus, his intellect was built on semiconductor technology. Moreover, in the new model of its sorter, IBM replaced the electromagnet with a vacuum suction cup. Thanks to such dramatic improvements, the Type 84 Sorter drove punch cards of ?000 pieces per minute. So through it more than 30 punched cards flew every second. 3r3122. Despite its technological primitiveness, electromechanical punch card sorters at one time revolutionized the processing of business data, and set the stage for the emergence of electronic card. "Mini" 3r3-3120. business-class computers, such as the IBM 1401. 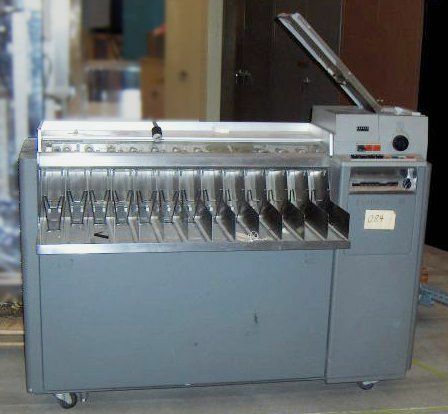 In addition, even after the advent of computers, punch card sorters remained in demand for a long time. 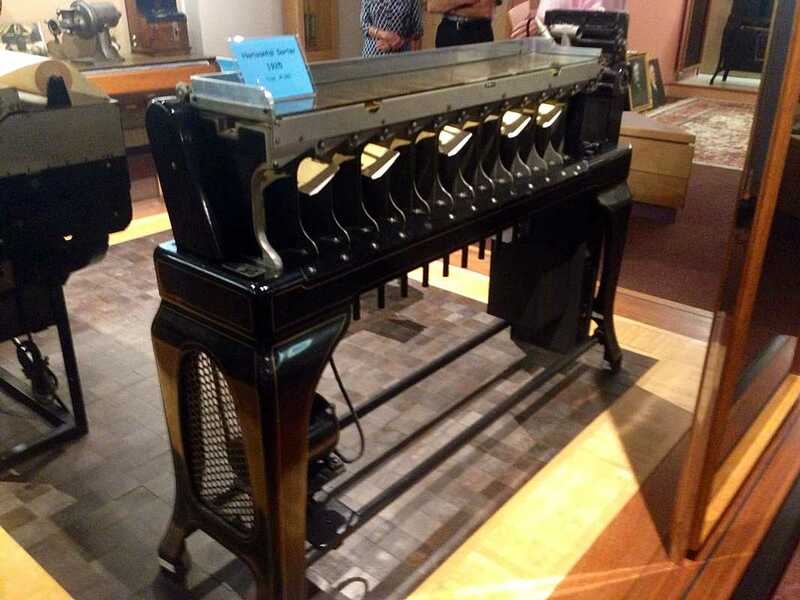 For example, the very first model of the sorter (IBM Type Sorter 80), released in 192? was maintained until 1980. 3r3145. 3r3122. 3r3142. Only registered users can participate in the survey. 3r3143. Sign in 3r3144. , you are welcome. 3r3145. 3r3152. Colleagues, I have more information about computing devices that work on the basis of punched cards. Should I still write on the near-punch card topic? 3r3204. Yes, let's ponder 3r3r204 more. decide for yourself what to write about 3r3204. No one has voted yet. There are no abstentions.